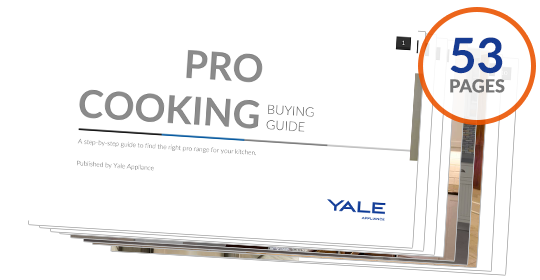 BlueStar and Dacor represent polar opposites for professional ranges. Dacor, now owned by Samsung, is completely gadget oriented with just about every feature imaginable. BlueStar is a simple product based on output similar to a true commercial range and devoid of any type of gadget. It does not even have a clock. 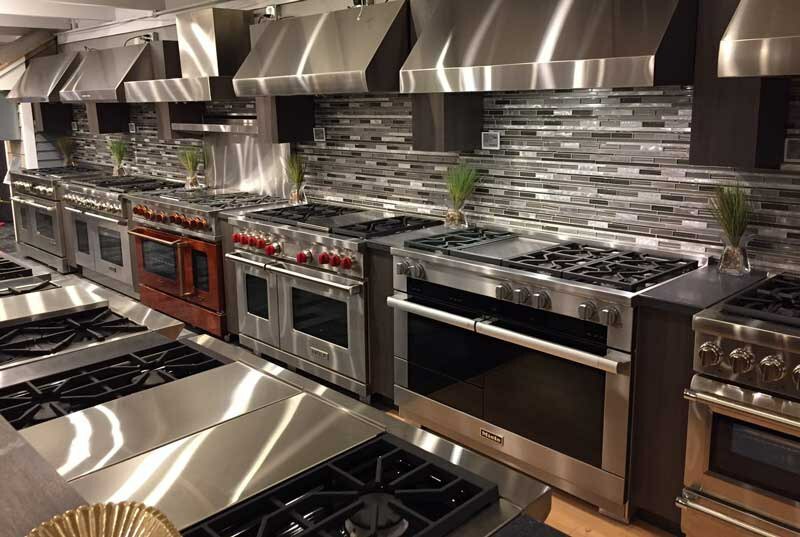 In this article, you will learn a bit about the latest professional ranges and then we will compare the many features of the BlueStar and Dacor 48-inch ranges. In the end, you will certainly choose one or the other because they have almost nothing in common. A few years ago, professional (pro) ranges were simple. They were mainly 6-8 burners with two ovens and a grill or griddle. Now, there are endless options whether it's color finishes, steam functionality, French tops, even higher output burners or Wi-Fi capabilities. Now pro ranges are categorized in three different groups. Basic functionality and restaurant aesthetics would be the first group including BlueStar, Wolf (all Gas), Thermador Harmony, and Capital. The second group has a basic clock and timer functionality like your stove at home like Wolf dual fuel, Thermador Pro Grande, Jenn-Air, and Miele all gas ranges. 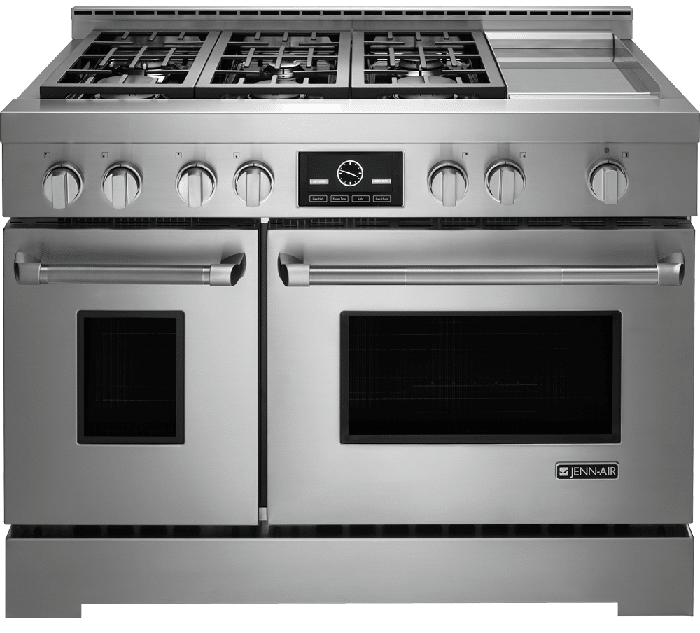 The last group has far more features and options like Wi-Fi, guided cooking, steam functionality, warming drawers, and even Sous Vide like Dacor, SKS, Miele dual fuel, and Thermador Pro Steam ranges. Let's take a look at Dacor and BlueStar and see which one might work best for you. BlueStar is a family-owned company based in Pennsylvania. They have been around since 1883. However, they are newer to pro ranges as of 2003 and are now manufacturing refrigerators, induction as well as hoods. Their ranges are known for their commercial style and high output for the burners as well as their infrared broiler. Both are the best in the industry. Their Platinum range is their best and most popular of 5 their different series. Dacor was a family-owned company until Samsung bought the company in 2016. In their early days, they manufactured the first 30-inch convection oven and were the first with pure convection. The first connected pro ranges were Dacor as well. Samsung added functionality and design to the older Dacor ranges. 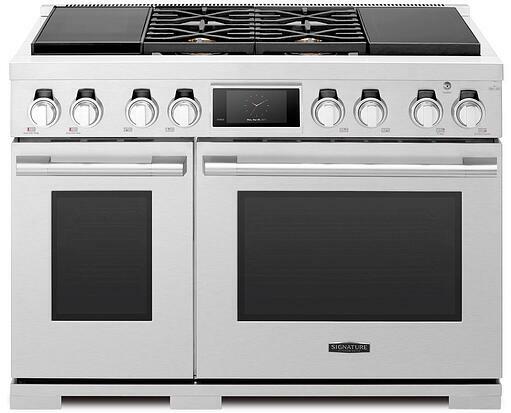 We do not sell Dacor, but do show the similar Samsung Pro Chef. Their Modernist is their best range. 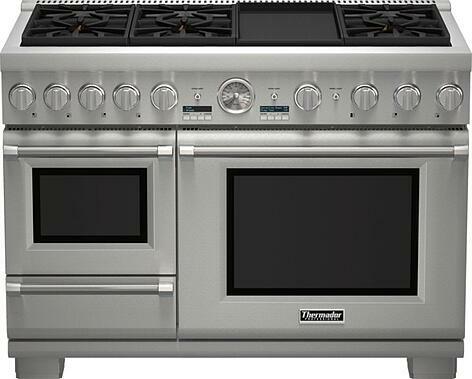 This Platinum Series range is the most popular as it offers 25,000 BTU burners. Power is not limited to just the burners. The infrared broiler is 1800 degrees. As an FYI, infrared is a direct intense heat and BlueStar is 300 degrees hotter than the next best, Wolf. BlueStar is the only pure convection gas professional range. The heat is blown from the back rather than the bottom for more even results than traditional gas convection. There are also 750 different colors plus 8 different trim and knob combinations, so BlueStar allows you to customize unlike any other range. 6 Burners with Electric Griddle – has the versatility to cook different food with the multiple burners alongside the griddle. Dacor has very good power with 22,000 BTU burners. The griddle is electric. The smaller oven is full featured as well using steam and convection. You choose whether you want to cook fully in steam or want to enhance the convection process using steam. Controls are excellent. You have a giant 7-inch LCD screen to look up recipes on the internet as well as use guided cooking apps (that functionality is still evolving). You can also control the basic functions through your phone. *BlueStar does not directly list the oven size in cubic feet. The number above was calculated based on the interior dimensions of the oven. BlueStar is the most powerful. However, the burners are open (they have to be for the oxygen to replenish the flame at a higher temperature). Dacor is sealed. Open burners are easy to break apart and clean in the sink while sealed burners are better at containing larger spills. 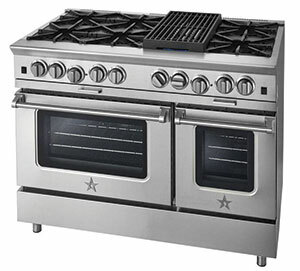 On other series of ranges, BlueStar has griddles and grills available. The Platinum has a reversible grill and griddle. It will be as good as Dacor's integrated, electric griddle because the burners underneath are so hot. The BlueStar pure gas convection is moister and better at roasting. 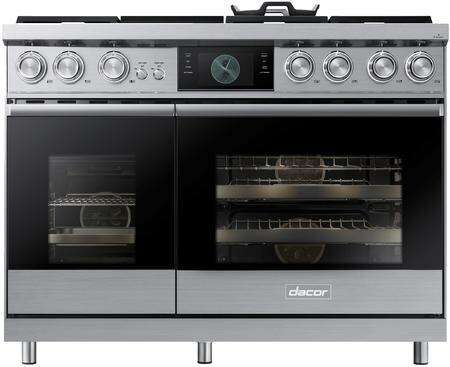 The electric convection of Dacor is drier and more precise for better baking. The broiler of BlueStar is the best to sear and far better than any other broiler on the market. Dacor is only a 4400-watt electric broiler vs the 1800 BTU infrared gas broiler. 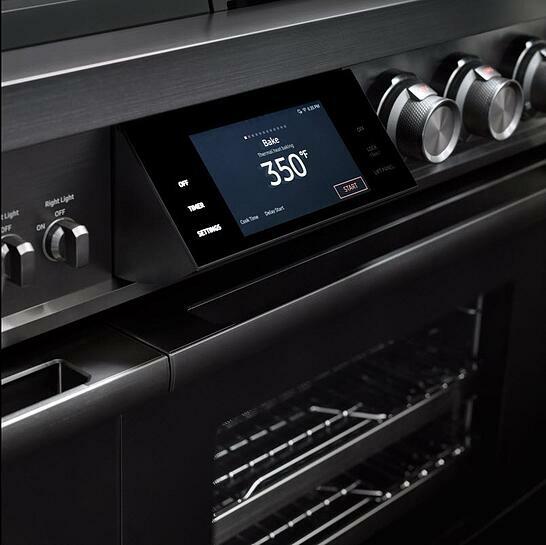 Dacor has steam functionality in the smaller oven. It will allow you to cook in different ways. Steam is excellent for veggies, but can cook almost anything better. BlueStar has no controls whereas Dacor offers every type of control imaginable including to operate some of the functions remotely through an app on your phone. Both are incredibly different ranges. It depends on what you like and how you cook. Dacor is Modern looking (the Modernist name gave it away) whereas BlueStar has 750 different color options. From a cooking perspective, if you like power, better roasting and broiling then BlueStar is your best option. Dacor would be better for baking with the ability to use steam as a real plus. You must have a professional to show you how to use steam, because it is very different than regular or convection cooking. We have two chefs for that reason. Cooking is better in steam than regular baking because it adds moisture. You just have to know how to use it. Unlike most of our comparisons, this one is easy depending on what you value.